Hello, lovelies~ No reviews for today, but I do have a beauty tip that I often do to keep my lips smooth and soft, without any of those flaky, drying unattractive bits. All you need are three items that can be found in your home. Simple, right? To make it easier for my Indonesian readers who don't have access to google translate, I will write the instruction in Indonesian on the picture. Yes, I'm feeling generous today, lol. Okay, first step is to gather the items that we need to keep those lips of ours soft and smooth. All you need is a petrolatum/petroleum based lip balm, a towel, and warm water. The lip balm will help soften any flaky bits on your lips and I find it easier to use a petroleum based lip balm rather than those with shea/cocoa butter. After all those items are nearby, you're one step ahead to soft, kissable lips, lol. 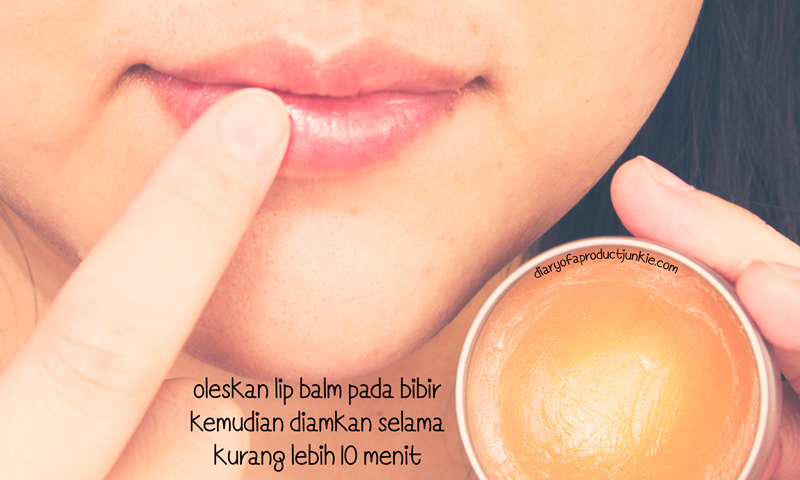 Apply the lip balm of your choice generously to your lips and leave it for around 10 minutes. The lip balm will help soften any dry skin on your lips so it will come off much easier in the next step. 10 minutes is up! Take your towel and dampen it with the warm water that you've prepared earlier. Wring out the excess water from the towel. Start to slowly and gently rub the towel on your lips. You won't need to use much pressure since the towel is already removing the dead, dry skin off your lips. Believe or not, you're done! There are no more dry bits on my lips afterwards. Slather some more lip balm on top of the 'freshly-exfoliated' lips to give moisture and keep it there. Pake lip balm apa aja boleh, ga dilarang, tapi~ kalo aku lebih menyarankan pake yang ada petroleumnya (kaya Vaseline yang segede-gede gaban). Tapi, ya, kalo ga mau juga ga masalah, masih bisa kok. Okeh? I often wipe my lips with towel before bath in the evening. But I never use lipbalm first, I should try then.